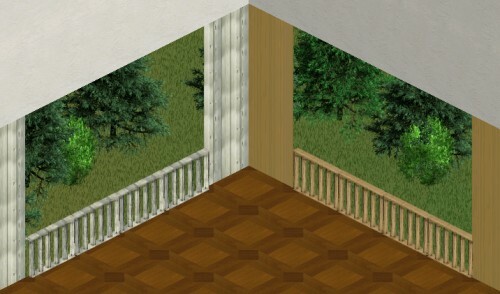 These rails are actually windows you can use them to create an open balcony with a roof. They're best used with the matching wallpapers (included). No expansions required. Diese Geländer sind in Wirklichkeit Fenster, mit denen du einen offenen Balkon mit Dach bauen kannst. Am besten sehen sie mit den passenden Tapeten aus (sind im Zip).